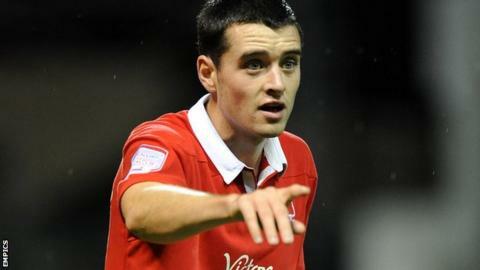 Bristol City have signed defender Brendan Moloney on a two-and-a-half year deal from Nottingham Forest. The Irishman was under contract until the summer but his Forest deal was terminated by mutual consent, allowing him to join City on a free transfer. He becomes the first signing for new head coach Sean O'Driscoll, who managed Moloney during their time at the City Ground earlier this season. The 24-year-old is available for Saturday's game with Ipswich. "He has been at a club where he has not had enough games because they have always had the ability to buy someone more expensive," O'Driscoll said. "If they sign someone who is more expensive, they usually play ahead of you. "He's a great character to have around and will fit in really well here at Bristol City." Moloney came through Forest's academy system and made his first-team debut in March 2007. He went on to make 49 appearances for the club, 16 of them this season. Capped six times for Republic of Ireland U21s, Moloney previously had loan spells at Chesterfield, Notts County and Scunthorpe United.